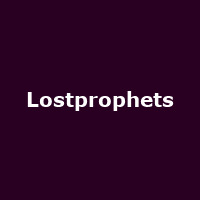 Much-loved metallers Lostprophets have announced tour dates for 2010 plus the release date for their new album also due next year. The tour takes place over nineteen dates (so far) right across the UK mainland and kicks-off in Leicester (De Montfort Hall) on 4th February 2010 before continuing via places as far afield as Hull, Margate and Yeovil. Big cities are well catered for as per usual, but the whole run ends in their manor, Port Talbot in South Wales at Afan Lido on 1st March. Tickets go on sale at 9am on October 30th. Price - £22.50 for most venues. Prior to all of this activity is the release of their much-anticipated new album entitled "The Betrayed" which gets a UK release on 18th January and includes the recent single "It's Not The End Of The World (But I Can See It From Here)". And before any of these shenanigans take effect, the boys appear at two November dates, one in London at the Union Chapel - Little Noise Sessions on Nov 20th and one in Lincoln at the Engine Shed on the 21st. - But you already know this as you probably have one of the very limited tickets!